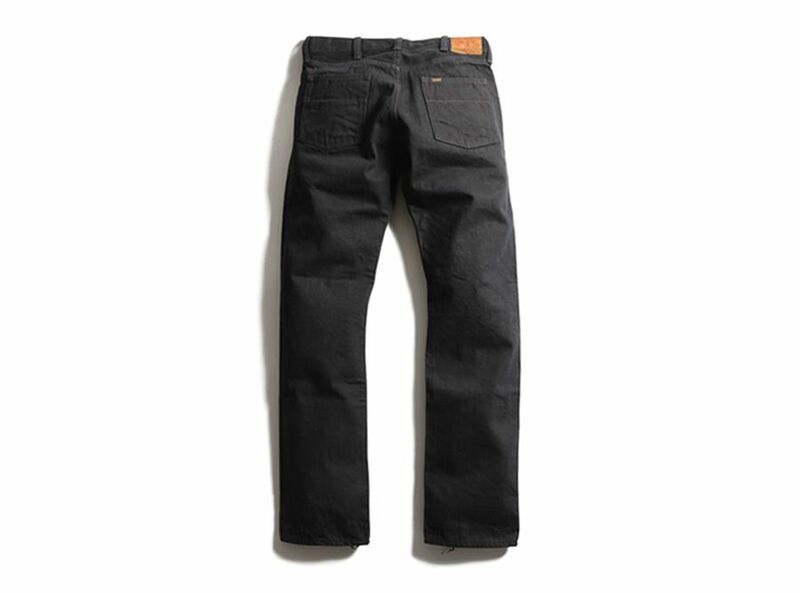 Currently trying to decide between the 3Sixteen SL-220X and Rogue Territory Stealth Stantons. Was wondering if anyone had any opinions on them as I have never bought from either brand. 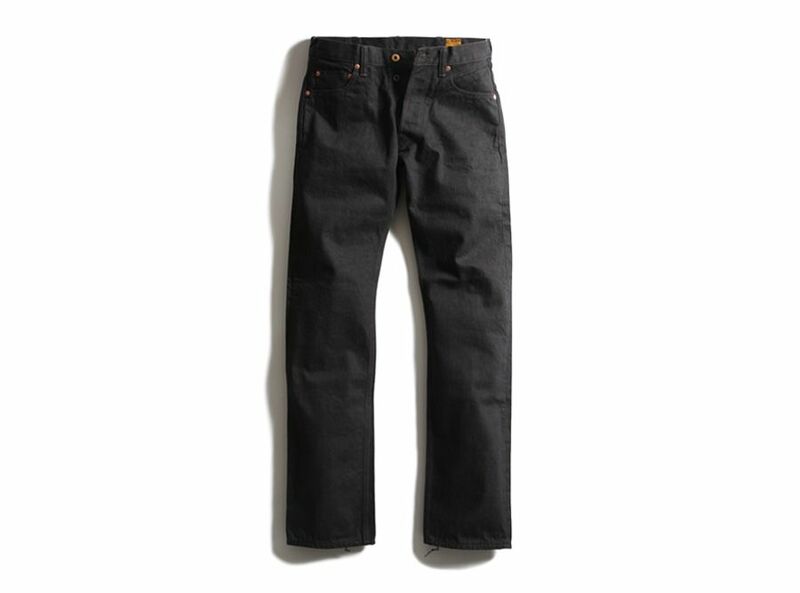 I'd buy the Iron Heart SB Devil's Fit instead if they ever restocked those! If you're a size 28 the Iron Heart store has a pair of beatle busters in SBG for 125 usd. 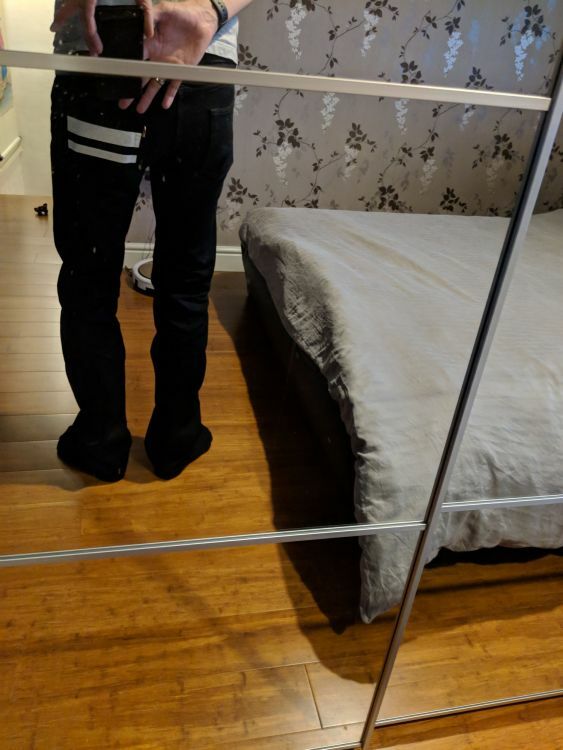 Can anyone please recommend any black jeans that fade indigo? Similar to Railcar Fine Goods Overdyed Slub 006. 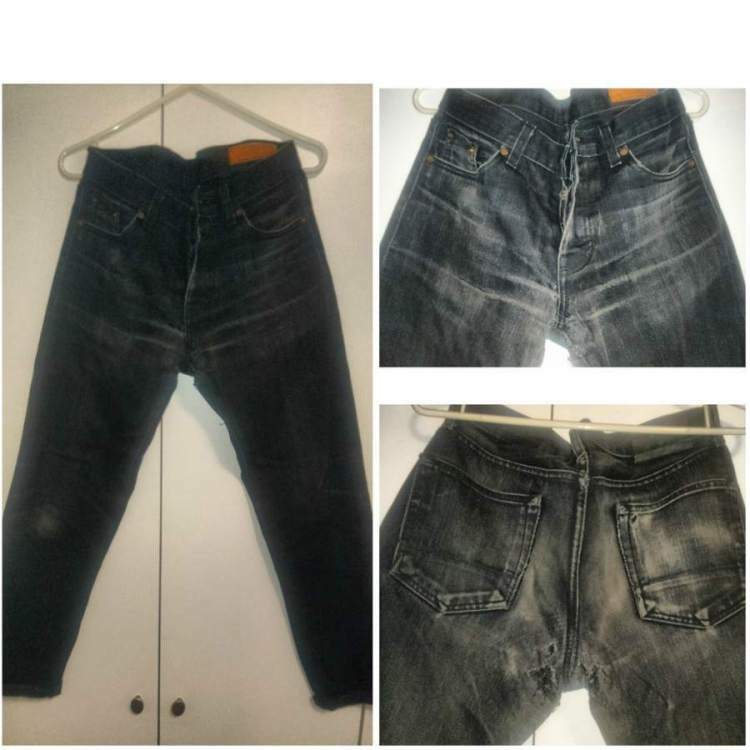 So looking for a pair of jeans that are black and fade into indigo in places of wear, and in tight straight fit. I've been suggested andewhall's but open to any other suggestions! I know fades are important but I like mine to keep their colour for as long as possible. Solid black have black warp and black weft whilst black have black warp and white/natural weft, similar to indigo jeans. 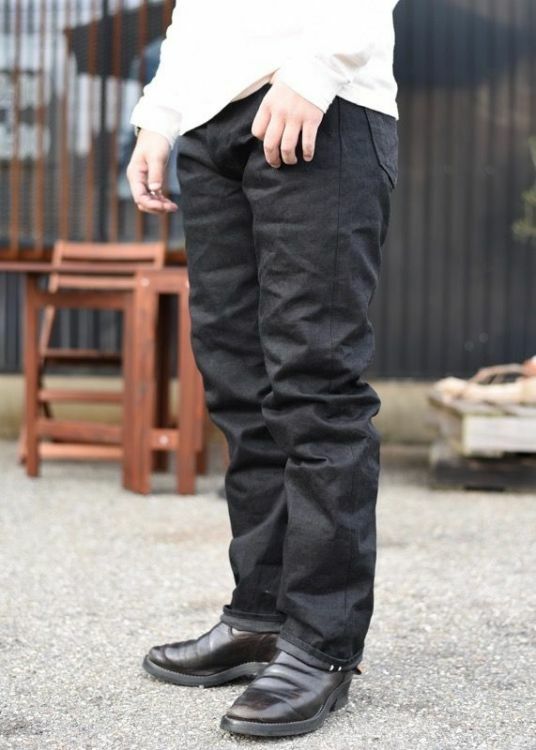 I ordered the new Sugarcane slim fit type 3 jeans. Will report when those come in. Deciding between these or 3sixteen SL-200s. Just washed my black Jean Shop Rockers. Sorry for the bad pics, was taken with my phone which obvs is not taking very good photos anymore. 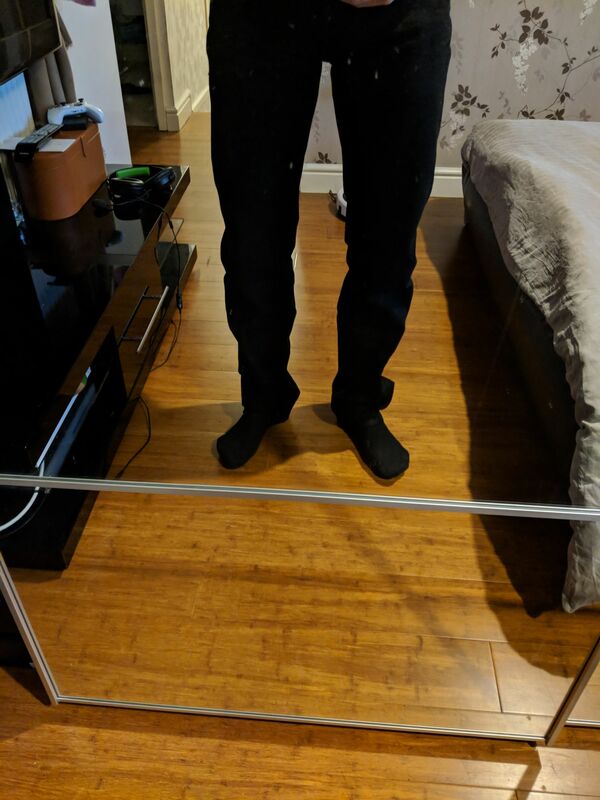 This seemed like the thread to revive in order to ask about recommendations for black jeans. 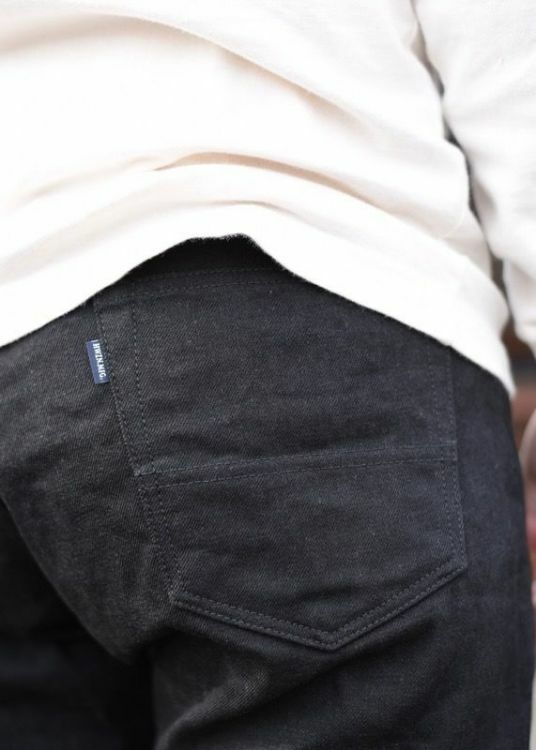 3sixteen’s entire line-up, Iron Heart 634, and the Sugar Cane Type 3 all have thighs that are a bit too thin. My ideal black jeans would have white/natural weft (though I’m willing to consider black/black) and a fit with higher rise, wider thigh, and moderate taper. Something like the full count 1101, warehouse 800, or Ooe 02 for fit. 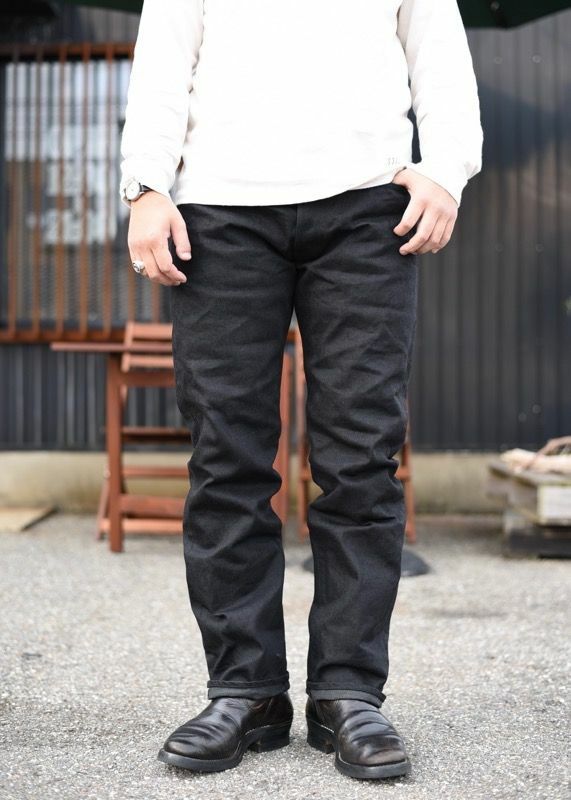 Unfortunately, it seems like since Ande Whall left the game, all the other black jeans tend to only be made solid black and in slim cuts. Has anyone else found themselves in this same search? I've found that I can fit in the black & beige IH 634S 21BLK. The fabric is worth it. I would love it if they produced the 1955S in this fabric, but it's not gonna happen. I'm not sure the 634 is selling that well TBH. It's too bad because it's a stunning fabric. I wear my trophy 1605bk. They are fading into a nice grey. The only thing I would change on them would be having standard pockets instead of the slant work wear front pockets. I'm not complaining because the pockets can fit my hands. Trophy also has the Blackie 1907denim, but it's on the slim side though. They claim they fade to a brown color. Would love to get a pair of them but can't find my size. They haven't restocked the style for months. ...all the other black jeans tend to only be made solid black and in slim cuts. 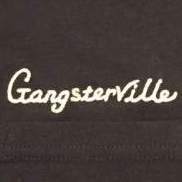 HWZN MFG would be awesome if Canvas would ship international. 14 oz Made in Japan and the price isn't bad. They have a jean jacket to match as well. I would love to have a pair personally but would need a proxy. 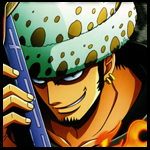 * There are individual differences somewhat Please forgive a few errors. Spoke too soon. Wolf Pack is selling them. Been wearing the 3Sixteen Ct 121X for work. Theyre beat to piss and fading very quickly. Will give them their first wash this weekend after a month of wear working construction. 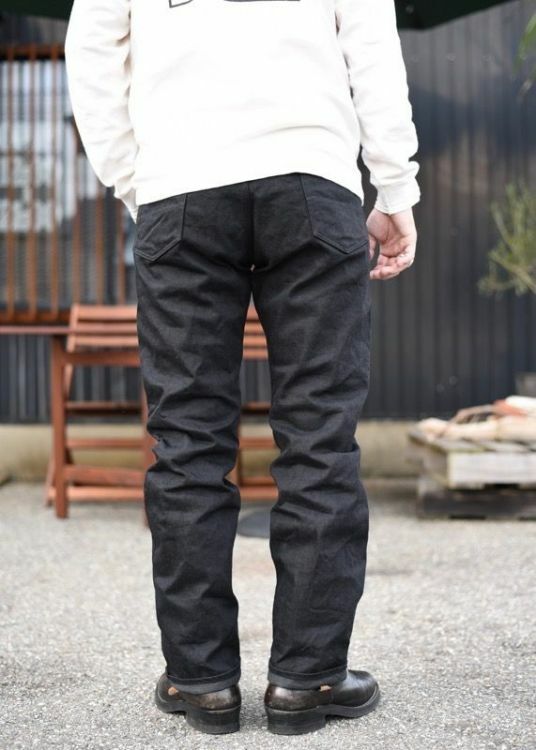 I think I posted back in the Blunders thread, but it's funny that Japanese denim brands will make very little if ever black denim styles but American companies will make black denim using denim from Japan like Niphon, etc. 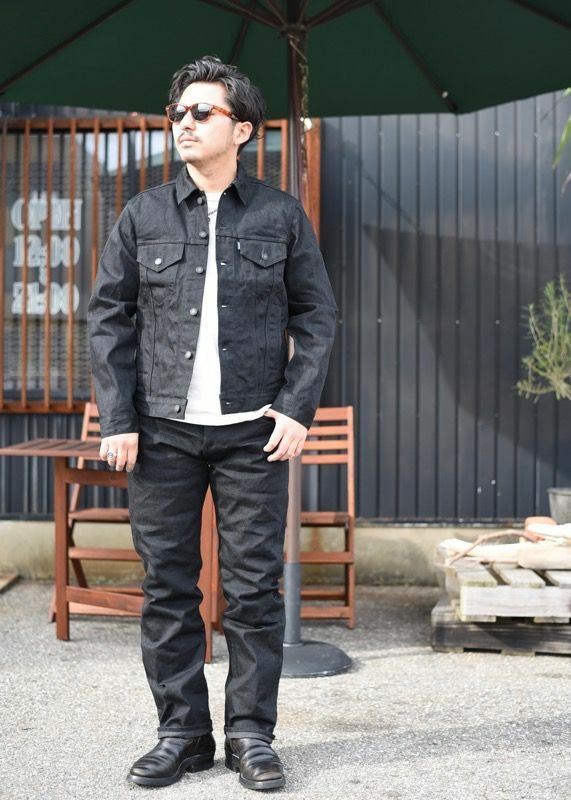 Black denim doesn't seem to be popular in Japan like blue denim of course. I've found that I can fit in the black & beige IH 634S 21BLK. The fabric is worth it. That does look like an amazing fabric - I'm disappointed there isn't more black/white or black/beige, black/light grey denim around. May have to give the 634 fit another try, as the measurements on ironheart.co.uk look like they could work... It's a pity Self Edge here doesn't carry this pair to test it out in person. Thank you also to @mlwdp and @chambo2008! 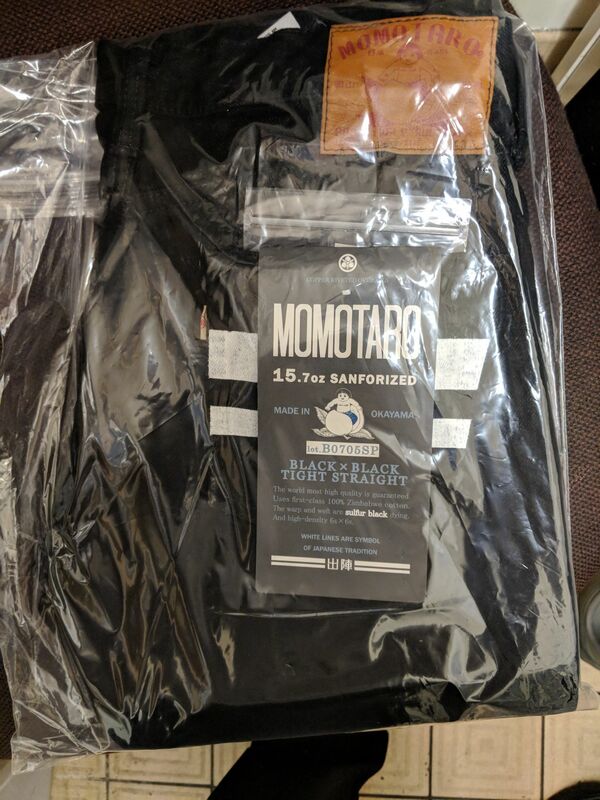 I love Momotaro and will always be on the lookout for something from them, though lately they seem to be sewing up even their natural tapered fit with tighter thighs. Never seen HWZN before, but I like the look of that denim and the super-clean styling on the jeans. @FeloniousMonkI would've bought the HWZN pair if I didn't already have a black pair of denim right now. Reporting in, although I’m not sure if I love black denim - although I do remember being quite fond of the last pair I had - but I certainly do feel that I need a new pair for those ”indigo jeans not quite proper enough, but wear formal trousers and people will think you are a dork” -occasions that I find myself in fairly often these days. Sooo... As catalogued in the relevant thread, I was looking at the Samurai S710BK a couple of weeks ago... Then I almost managed to snag a pair of S710BKBs but after a few days of Whatsapp-tennis, it turned out that they don’t have it even though they thought they did. But I digress. Since then, I have kind of been gravitating towards Iron Heart’s 555-03 and just about the only thing holding me back at this point is that I’m not crazy about the vanity-sized waist and the skin-tight fit from thighs down. However the positives are numerous, including but not limited to the highish rise, reasonably spacious thighs and the fabric used; the same fabric is also available in 777 cut which is also not totally out of the question, but the availability of that one is limited and the rise is lower than I’m probably willing to accept. 634 is not really for me as I try to keep the leg-opening at or preferably below 8” (in tag size 32ish). 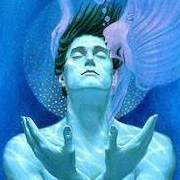 Considering the above, is there anything else out there that I should take a look at? I prefer heavier denim (limits my options by a ton) and black warp-weft (otherwise I would have grabbed the aforementioned S710BK and called it a day). Regardless of what I said about semi-formal use above, I like my denim to fade cos that’s how I roll (in reality the most impressive evo I seem to be able to develop are blown out pocket-bags, my speciality ). Suggestions (other than dial down the drivel, dork)? I like & wear black denim, but to me they are more, rather than less, casual than indigo. The step up from indigo is indigoXindigo, IMHO. Kinda in the same boat as @julian-wolf, I've almost given up on finding black jeans that suit what I'm looking for. Is it the sizing or style that is hard for you to find?